6sigma.com offers Lean 6 Sigma Certification and Training courses in: White Belt, Yellow Belt, Green Belt, Black Belt and Master Black Belt. Global 6 Sigma also offers Certification and Training courses in Calgary, Alberta, Canada: Lean Six Sigma, Design for Six Sigma, Green Process Management and Minitab. The Alberta government states that the province’s unemployment rate has been a record low; nevertheless, the annual employment increases drastically accounting for 52.4 percent of Canada’s entire growth. Both full-time and part-time jobs have increased massively recently, and there is a lot of competition for every job opening. In order to get yourself noticed in a booming market, you need to have a set of skills or some kind of traits that make you a better candidate than others. 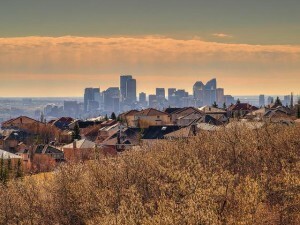 Canada witnesses its ups and downs in the employment and unemployment percentages quite frequently, and the same can be said for Alberta as well. But, you can prevent unemployment happening to you with a lean six sigma training certificate that will mark you as one who belongs to the topnotch employees. Alberta possesses one of the lowest tax burdens in the country with public sector salaries that are relatively very high. For years, the province has been a land of promise, but the current statistics vary greatly from the region’s earlier statistics that signified the most accelerated annual employment growth among all provinces. These benefits are not restricted to only the above mentioned areas, a Lean Six Sigma Training Certificate will qualify you for the most competent jobs in your relative industry and train you perform all the right tasks that will make you the right candidate for any job. What Will Lean Six Sigma Training Do For You? A Lean Six Sigma training program is a great way to attain benefits that are significantly better, specifically in terms of remuneration. Your skill set is drastically enhanced and you are equipped with all the characteristics of a highly preferred job candidate. It is basically a training program that can help you attain all the right skills and expertise, enabling you to provide more to your organization and becoming indispensable. Any youth in search of a job recognizes the obstacles that face them, and the obstacles vary geographically. Calgary is a place of booming businesses still, but the unemployment rate is increasing gradually. To beat the common procedures and stand out as red among a crowd or grays is achievable; Lean Six Sigma Training program with 6sigma.com will train you to be the employee that any organization would be proud and happy to have in their repertoire of successful employees or to hire someday. Following a multimillion-dollar renovation, the Calgary Marriott Downtown Hotel affords business and leisure travellers an effortlessly chic welcome to Alberta. The hotel offers guests unparalleled accommodations with custom duvets; 48-inch, flat-screen televisions; high-speed Internet access and dramatic views of the city and the Canadian Rockies. Other amenities, like the fitness centre with state-of-the-art equipment, Canada's first M Club Lounge, an indoor pool, concierge service, a business centre, laundry service and valet parking ensure every need is met. Similarly, the dining options speak to modern taste: An on-site Starbucks lets guests jumpstart their mornings, while ONE18EMPIRE specialises in exceptional whiskeys, local food and shareable plates. Business travellers, meanwhile, stay productive within the more than 11,000 square feet of dynamic meeting space. 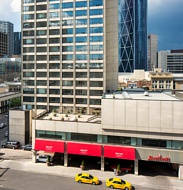 Located in the heart of downtown Calgary, the hotel is near the famous Calgary Tower and Glenbow Museum, and vibrant restaurants and bars.